I'd been chased by the Ripper ghost and stabbed and turned into a terminus, but oh, no. In the end, math. Maths. That was the butterfly that caused the earthquake on the other side of the world. This is all going through my mind when Thorpe started talking about an UNCLAIMED, UNCLAIMED, UNCLAIMED BODY! Like maybe there was a warehouse of unclaimed bodies somewhere, next to the unclaimed sofas and TVs and tires. And maybe you could buy one and take it home and dress it up and pretend you had a friend. Except it would be an unclaimed body and would keep falling off the unclaimed sofa you have also just purchased, and eventually you would have to store it in the unclaimed freezer or it would rot. England is strange in many ways, and one of those ways that they eave things like Stonehenge sitting at the side of the road. I think I expected something more like Disneyland, with all kinds of buildings nearby, and maybe a water slide called Druid Dunk! or something. Maybe I thought it would be larger, or behind a wall. No. It was just there, in the field .It wasn't as big as I thought it would be. Several of the stone had fallen over, so really, it was just a pile of rocks. Important rocks, to be sure. England loves important rocks. Everyone loves important rocks. Yea! Finally some resolution after the cliff hanger of The Madness Underneath! Seriously, that cliffhanger was rough. Don't worry though, The Shadow Cabinet doesn't end in a cliffhanger. Yes, there is another book, but you're not feverishly flipping the page to find the next chapter only to be greeted by the acknowledgments. The Shadow Cabinet begins with Boo and Rory trying to find Stephen's ghost, to no avail. Throne steps in and takes over, making his first priority getting the group to a safe house and concealing Rory's identity. Having run away from Wexley, both her parents and the (normal?) police are attempting to find her. Obviously this is an issue because if Rory is returned she cannot help find Jane and Company, and thus cannot help find Charlotte. Also, Rory adamantly refuses to leave, especially since they don't know where Stephen is. After following a lead, because let's be honest Rory isn't going to sit around and dig through paperwork like Throne told her to do, she encounters none other than Jerome and his new friend Freddie. While I wasn't bummed when Rory broke up with Jerome, I'm not his biggest fan, I do like the new role he has taken in her life. He finds himself wrapped up in Rory's new world; both he and Freddie contributing in finding Jane and Co., dealing with the aftermath of The Madness Underneath, and the events that unfold in The Shadow Cabinet. Maureen does an exceptional job of keeping her reader in the story. The pace is fast and didn't slow down to a point where my mind started to wander and doing the dishes didn't sound like a bad idea. While we have moved passed The Ripper, everything in this novel is still connected to him. Because of this one crazy ghost, Rory's life has changed forever. And not just her, but also all of London. We start to see the hidden underbelly of London and learn that some of its deepest secrets actually go a lot deeper than suspected. 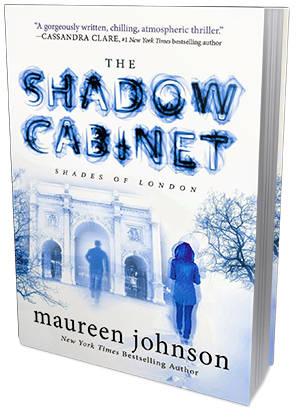 London is a real place, but the world that Maureen has created is so interesting and involved. It feels real. These characters feel real. Yes, it's a supernatural novel that deals with ghosts, but I never feel like I have to suspend reality to understand what is happening. To me, that's the mark of a great writer. The topic isn't real (depending on who you ask anyway), but the writer makes it feel real. There are ghosts traipsing around London, there are "rocks" that are keeping the majority at bay, there is a young girl who has the power to zap them with her hand because she got stabbed by a ghost emulating Jack with Ripper and the magic diamond made it happen. You see? When I say that it sounds crazy. When Maureen puts it in a book, it sounds legit. I know a few of you have been putting off reading this series because you have heard of The Madness Underneath's cliffhanger ending - and yes, it was a doozy - however, I don't think you should keep putting it off now that The Shadow Cabinet is out. Not only is this an amazing series, but I really don't want this series to be spoiled for you! Maureen is kind enough not to give us another cliffhanger, but there is definitely that feeling of needing more. Things are going to come to a head in the next (last?) book and I have a feeling it's going to be quite an adventure.